According to Politico, a lot. Writes Kenneth P. Vogel, "the committee, SarahPAC, also spent nearly twice as much – $742,000 – as it had in any previous quarter, the lion's share of which went to the type of list-building and fundraising (including its first major direct-mail campaign) that typically undergird top-tier political committees." He adds, rather chillingly, "for the first time since the 2008 campaign when she was the vice-presidential running mate to GOP presidential candidate John McCain, Palin is supported by a political operation befitting someone considering a presidential run." So what makes SarahPAC a proto-presidential PAC? Let's look at the receipts. Politico reminds us that Palin has a bad habit of not showing up for stuff (like the second half of her term as governor?). But with $11,000 worth of scheduling assistance by Alaskan company True North L'Attitudes (which doesn't appear to have a website), Palin should be able to make all her campaign appearances on time — if she feels like it. There's an old Alaskan saying that when you scratch a grizzly's back, a salmon gets its wings. In that fine frontier spirit, SarahPAC made contributions to the PACs of a variety of other conservative candidates. One beneficiary: Nevada senatorial hopeful Sharron Angle, who helpfully suggested that girls impregnated by their fathers could make "a lemon situation into lemonade." SarahPAC shelled out over $10,000 to Nashville party-favor company Nico and LaLa for some custom-made Paliniana, including t-shirts and plastic cups. Once the 2012 race heats up, Nico and LaLa can surely win over undecided voters with its adorable personalized cupcakes. You can't run a presidential campaign on Facebook alone, so SarahPAC paid direct-mail marketer HSPDirect $154,000 to stuff real America's mailboxes full of Sarah. HSPDirect also has a super-fun YouTube channel, which includes this very convincing ad for freedom (from unwanted medical care). Just kidding — kind of. Remember how Bill O'Reilly said Palin needed to go to "world affairs college" in order to be a presidential contender? Well, SarahPAC is paying her tuition — a $10,000 monthly fee for "national and international issues" consulting. For that kind of money, she should definitely get an A. This is not a joke. SarahPAC paid a company called Indian Valley Meats $3,800 for caribou jerky to give to attendees at the Southern Republican Leadership Conference. Can caribou cupcakes be far behind? 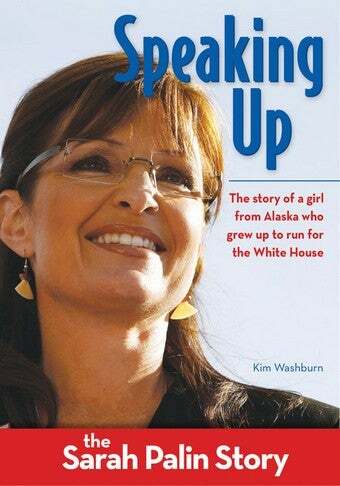 One thing SarahPAC didn't pay for: Speaking Up, a biography of Sarah Palin for 9-12-year-olds, to be published by HarperCollins's Christian division in September. This kiddie Going Rogue will be penned by Kim Washburn, who used to work for Focus on the Family and who appears to be concurrently writing Breaking Through by Grace: The Bono Story. Don't get them mixed up, Kim!